SCOTTSDALE, Ariz.--(BUSINESS WIRE)--Carlisle Companies Incorporated (NYSE:CSL) announced that the Crew of the American Spirit will begin to row across the Atlantic Ocean on December 14 in the Atlantic Challenge, known as the “World’s Toughest Row.” Carlisle has a website in support of Carlisle’s American Spirit for employees and all supporters to track the team’s progress, which can be found at: www.teamcarlislecrew.com. The teams’ progress can also be followed on many social media sites, including Facebook, throughout the race. D. Christian “Chris” Koch, Carlisle's President and Chief Executive Officer commented on the race, “We are again honored to partner with the crew of Carlisle's American Spirit for the 2nd year in their quest to win the Atlantic Challenge. We are very proud of these incredible athletes and courageous competitors. We will be monitoring their progress and cheering them on in their efforts through our website." Rowing across the Atlantic Ocean requires an extreme amount of courage and stamina. No one embodies courage more than the American Spirit's Captain Jason Caldwell, and his crew members Angus Collins, Alex Nelson and Matt Brown. Organizing and managing this effort is Tom Magarov, last year's American Spirit crew member, whose experience as a racer and attention to detail adds a unique advantage to the team. All competition-level rowers, these men are experienced in open sea events and will share the cramped space aboard, never leaving the vessel for the duration of the race. 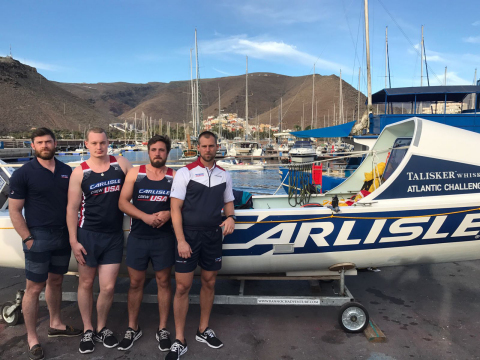 With two rowing positions, these athletes will be pulling Carlisle’s American Spirit 24 hours a day through ocean waves, often 12-16 feet or higher, in an attempt to achieve a new Atlantic world record crossing time under nature’s relentless and intense conditions. At just 28 feet (8.64 meters) long and less than 6 feet (1.74 meters) wide, the compact craft will hold the latest technology, safety equipment and rations to support American Spirit's crew in the Atlantic Challenge fours event.